Since opening its doors in 2007, Grille 29 has been one of Huntsville's favorite and most decorated restaurants and we are proud to have expanded this tradition to Birmingham in 2015. Mouthwatering dishes, seasonal ingredients, and warm hospitality come together seamlessly for weekend brunch, lunch, and dinner seven days a week. In addition to guests' favorites, our culinary team offers fresh, seasonally inspired specials that change daily. 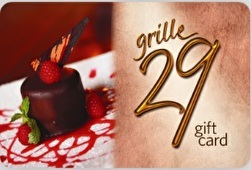 Your culinary journey will not be complete unless you experience dessert at Grille 29! Chocolate peanut butter truffle, chocolate soufflé, and the trio of crème brulee are just a sampling of delectable desserts made to order in the dining room. Grille 29 Gift Cards are welcomed at both our Huntsville and Birmingham locations. We look forward to seeing you at Grille 29! For balance inquiries call the phone number to a Grille 29's location below.